A novel concept, but one we can't see being too alluring in this iteration. However, make it slimmer, more portable and brighter, and there's a lot to like about having a 23-inch tablet in your pocket at all times... Sony's onto something here, but the Xperia Touch has a long way to go before this is a must-have product. When we first saw the Xperia Touch last year, it was nothing more than a concept, boringly called the Xperia Projector. However, it's made it out of the Sony labs and into the real world - and we're finally going to see whether the 'taste of the future' so many brands have touted (ie embedding projectors onto spaces around the home) will actually work. 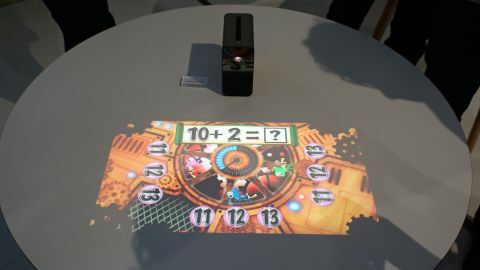 The blocky device will sit wherever you want it to and even has an embedded battery to let you take it out and about - and there are multiple ways to use it, from projecting down onto a table, gesturing in the air to connecting to your PS4 as a Remote Play machine. But is this just a concept with a real name, or is this a new wave of device that Sony is pioneering? While we annoyingly don't have much information on price (although educated guesswork would put this around £300 / $400 / AU$ 550) the Xperia Touch release date has been set for spring of this year - and pre-orders have gone live already. So if you want to start projecting bits of your life into the real world, you won't have to wait too long to step into that future. The design of the projector feels rather large for what it is: basically a large tablet screen thrust onto any nearby surface. Then again, it needs to hit a certain brightness intensity to work well enough to use day to day, so a larger body allows for more powerful optics and lamps. While there is a battery inside, the Xperia Touch clearly isn't a portable device, rather something that's tethered around the home but mobile enough to be carried into different scenarios. If the kids want to play some PS4 in their room, they can just lift it off the kitchen table and take it upstairs, until they're shouted at by their parents to 'BRING THAT THING BACK DOWN, DO YOU KNOW HOW EXPENSIVE IT WAS? WE'VE TOLD YOU ABOUT TAKING IT WITHOUT ASKING'. The top of the device has a camera on the top, which allows the Xperia Touch to see your gestures from afar - there’s not much else on the top apart from an NFC section, which is presumably something to do with Bluetooth pairing, although we couldn’t get a definitive answer on that. If you move it further out, you’ll extend that up to about 80 inches, but you’ll lose the touchscreen ability as it needs to be flush to a surface to register your digits. That means you've got the same app drawer, swiping functions and notifications shade you'll find in other Android devices, making it easy to use and navigate through. The Xperia Touch is surprisingly easy to use, with your finger being picked up easily despite feeling like it should be hard to register. Shadows don't seem to get in the way, with the (presumably) laser sensors working out where your digits are, and even responding to multiple touches at once. The response is remarkably quick for something you can't really touch - however, depending on the surface you're projecting onto it can feel a bit weird gliding your finger through the interface. There are a lot of sketching options available on the Xperia Touch (obviously, given your finger is the perfect paintbrush, especially for children) but if you've got a harder or rough surface it can get tiring to keep stroking across. We're not saying it's terrible, but there's a disconnect with the tactility that we're not used to any more, thanks to years of swiping shiny glass in the hope that someone, anyone, out there will talk to us. There's also a gesture mode available for the Sony Xperia Touch, so the projector can be throwing the screen up onto the wall and you'll be able to move your hand around from many feet away and be able to scroll through a map - it doesn’t work that well though, as even the ‘experts’ on the demo were unable to properly zoom in and out of web pages, and controlling the cursor was quite hard to be accurate with. In terms of the way that the interface looks, it's surprisingly bright and 'filling' on a table with some apps, and utterly pointless in others - for instance, YouTube videos looked really bland. The projector can only fire out 100 nits, which is a fifth of the amount the new Samsung Galaxy Tab S3 can manage. It seems to depend on which app is being used and the lighting conditions around, but in a normally-lit house you should be able to get the experience of a tablet on any surface. The range of apps available that are tailored to the tablet are obviously limited at the moment, but the demos are pretty fun: the collaborative kids math app is a good example of how the Xperia Touch will enable interactivity, and the sketching apps are fun to play with if not great options for becoming a world-renowned artist. There's just one thing that's concerning with the Xperia Touch: why is it any better than a tablet? The gesture mode, where you can project onto a wall and interact from afar, is a good use case, but it's not really necessary. It'll depend on the price, but the current iteration of the Touch is only slightly larger than an iPad Pro, and that's got all the elements that people are looking for: bright screen, easy interactivity and a smoother surface to glide across. Essentially, if Sony created an Android tablet at the size of the iPad Pro that you could use around the house, it would have all the benefits of the Xperia Touch without the lack of brightness you get with a projector. Then again, there's something nice about having a display dedicated to certain functions that sits in the corner - perhaps this is the first step from Sony to something bigger, but right now it feels like a concept that's still trying to find a home.